Associations – one-to-many, in a web service. Work on Lab 2. // For most one-to-many associations, the to-one end is "required"
1. 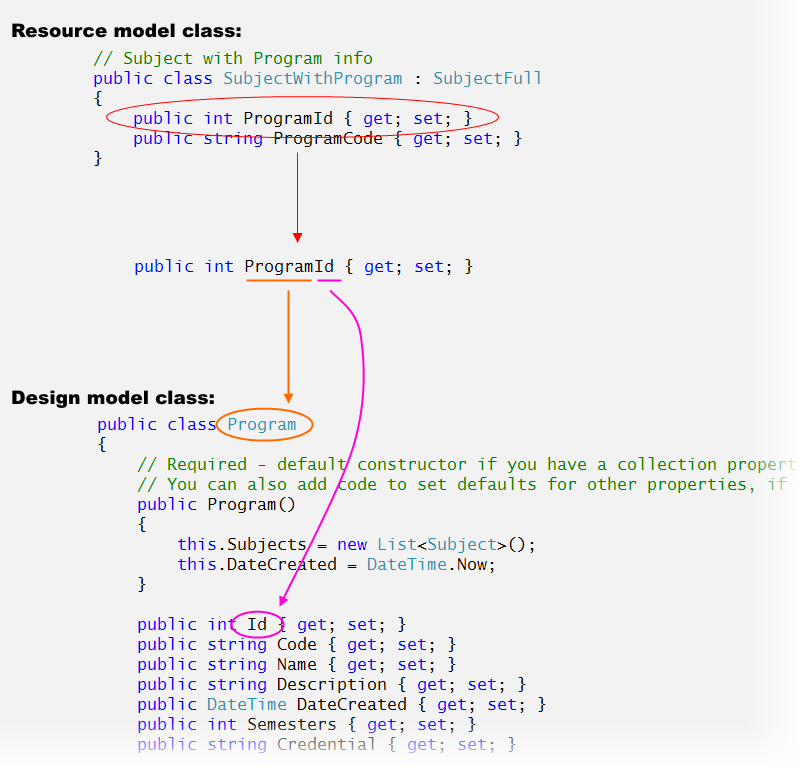 In a new resource model class, add a property with a type that matches the property in the associated type. The property name must be a composite of the design model class name and the property name. 2. Add an AutoMapper map to Global.asax.cs, which maps the design model class to the new resource model class that you created in step 1 above. You can see more in the AssociationsIntro code example. Look in the Vehicle_vm.cs source code file. You can see more in the AssociationsIntro code example. Look in the Manufacturer_vm.cs source code file, and notice the ManufacturerWithVehicles class, which includes a IEnumerable<VehicleBase> collection property. In the AssociationsIntro code example, look for its usage in the Manufacturers and Vehicles controllers. There are methods that enable a requestor to get an object (or collection) with or without the associated object(s). The DbSet<TEntity> Remove() method will remove, or delete, an object. As you would expect, if you delete an object (that is not associated with another object), the object is deleted. Obviously. In a one-to-many association – for example, manufacturers and vehicles – what happens when you want to delete an object at the end of the to-many association – for example, a vehicle? That’s simple and intuitive: The (vehicle) object is deleted. What happens when you want to delete an object at the end of the to-one association – for example, a manufacturer? 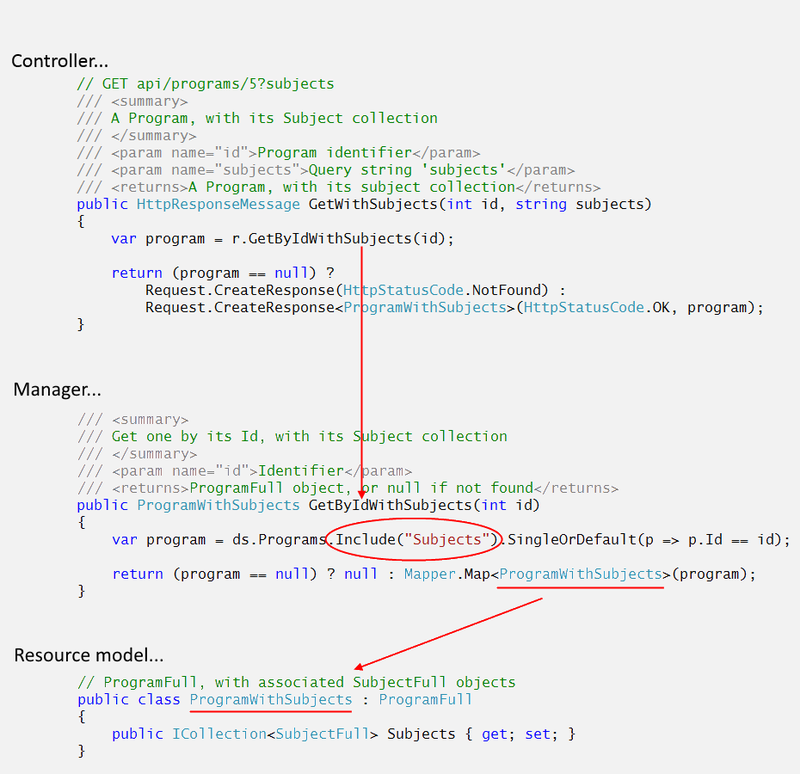 Well, the default behaviour of the data context and Entity Framework implementation is to delete the to-one object, and ALL the to-many objects. In our manufacturer/vehicle example, deleting a manufacturer will also delete all its vehicles. Is that a good idea? It’s very destructive. Why does it do this? The reason is that the default settings have “cascade delete” enabled. If you don’t like this behaviour – and we don’t, for most of the scenarios in this course – we can change the setting. How? // association is "cascade delete"
Lab 2 has been posted. A portion of your work will be checked and graded in class before you leave today. The rest of the work is due next Monday.